The Muppets of Sesame Street are some of the most popular characters of all time. This website includes links to a few of the books, movies, and toys devoted to the lovable gang of Sesame Street! Here are some of the products available. This is not yet a complete list, but I'm adding items to the list daily. If you wish to purchase any of these products, click on either the title or the picture or the product name to be directed to Amazon.com. As a warning, I have put up the pictures to give you somewhat an idea of the style of each item, so the pages may load slowly, depending on the speed of your internet connection. For Sesame Street toys, go to the Sesame Street Toys Page. By Abigail Tabby What could Baby Cookie Monster love more than cookies? His mommy’s kisses—that’s what! This Sesame Beginnings title includes a touch-and-feel surprise at the end. By Anna Jane Hays During the second year, babies master basic physical actions such as standing, sitting, and reaching; imitation plays a big part in this learning. Each spread of this gatefold book presents characters demonstrating simple actions. Rhyming text encourages the child to try as well. 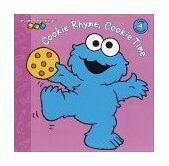 By Abigail Tabby In this lift-the-flap board book, Baby Cookie Monster dances to rhymes about different kinds of cookies and different kinds of dances, from a Peanut Butter Cookie Bop to a Ginger Snap Tap. Rhymed text adds rhythm for toddlers and parents to dance to. By Tom Cooke What smells so good in Cookie Monster’s kitchen? Cookies, of course! Join Cookie Monster in his kitchen as he cooks up a storm! By Felice Haus Cookie Monster plans a party to celebrate his birthday, but before the guests arrive, he can't resist a tiny taste of the cake. It isn't long before the cake disappears. Fortunately, Cookie's friends help him solve his party dilemma in a story that makes learning to read a piece of cake. By Linda Hayward Some butter. Some sugar. Some eggs. Some flour. Can Cookie Monster bake the biggest cookie in the world? He's sure going to try in this mouth-watering tale. By Linda Hayward Cookie Monster is baking up batch after batch of delicious cookies at the bakery. The problem is, he sells them so quickly he never gets a bite. The faster he bakes cookies, the faster hungry monsters gobble them. 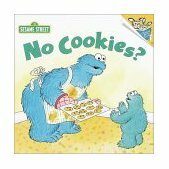 Everyone on Sesame Street is eating Cookie Monster's delicious cookies, but will he ever get to eat one? This Step 1, Step into Reading treat will have kids laughing out loud and chanting along with the catchy, rhyming text. 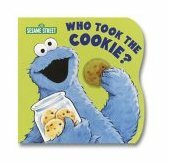 (Board Book) Here’s a humorous Sesame Street version of the familiar childhood game “Who Stole the Cookie from the Cookie Jar?” One by one, the cookies disappear from Cookie Monster’s cookie jar. Who do you think gobbled them up? An attention-grabbing lenticular shape on the cover makes this even more fun for all! By Sarah Albee Cookie Monster is befuddled when his nephew, Little Max, doesn’t want any cookies. No cookies? How can this be? Maybe he’s not feeling well, or maybe he’s not hungry. But he is hungry for a healthy lunch of a sandwich and fruit. Cookie Monster is baffled–where did he go wrong? By Constance Allen Cookie is planning a party! There's a lot to do--make invitations, shop, clean the house, and cook. But Cookie's favorite time is when all of his Sesame Street friends are seated at the table and he says, "Let's eat!" (Furry Faces Board Book) by Anna Ross They're funny! They're furry! They're bound to be favorites! 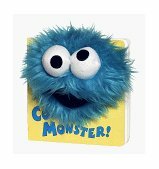 Just wait till kids get their hands on these lovable Furry Face board books featuring beloved Sesame Street characters right on the cover. Inside, kids will find bright, bold illustrations and loads of fun. By Emma Jomes In a new, larger size, these colorful, collectible, and entertaining Jellybean Books are sure to appeal to preschoolers with their favorite Sesame Street characters and simple stories just right for growing minds. By Tom Cooke He's taken out his little chef's hat, his little bowl, and his big bag of chocolate chips. So what is Cookie Monster up to in his kitchen? He's making cookies, of course! Toddler's guess what Cookie Monster is up to, when he goes into his little kitchen and takes out his chef's hat, his little bowl, and his big bag of chocolate chips. For children under three. By Mike Pantuso Cookie Monster may eat just about anything, but he knows what’s good for you. To share his great love of food, Cookie has written his own little book (with just a little bit of help). In it, he shows us all his favorite healthy meals and snacks: fruits and veggies, sandwiches at the beach, popcorn at the movies, and more. And after a healthy meal, it’s time for dessert–and we all know what Cookie’s favorite dessert is! Cooookies! Here, in his unique voice, and with his own brightly colored finger paintings, is Cookie Monster’s very first, very colorful book. By John E. Barrett Cookies and milk never tasted so good before Baby Cookie Monster got his new cup! Hold on tight as Cookie lets go of his bottle--and learns to love drinking from a big-boy cup! (Open Sesame - English as a Second Language Series) This third in a series of seven includes a student book, teacher's book, activity book, and duplicating masters for teaching English as a second language to ages five to ten. Focuses on the four skills: listening, speaking, reading, and writing, using songs, stories, conversations, games, etc. By Anna Ross Ernie and Bert like to color with fat crayons. But not the monster! Big Bird likes to give his teddy a bath. But not the monster! So what does Cookie Monster like to do? By Richard Brown This educational book was created in cooperation with the Children's Television Workshop, producers of Sesame Street. Children do not have to watch the television show to benefit from this book. Workshop revenues from this product will be used to help support CTW educational projects. 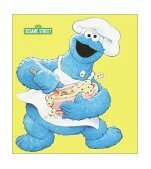 (Golden Sturdy Shape Book) Cookie Monster and friends show nutritious things to eat at various times of the day. 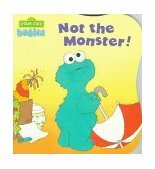 By David Korr Cookie Monster and a clever, selfish witch are forced into a seemingly impossible situation: sharing cookies. By R. Koeppel "'C' is for cookie, that's good enough for me ..." is the popular song by the cuddly Cookie Monster. Who else would be perfect to introduce the letter "C" in the latest Sesame Street series of books on letters and numbers? Kids will be hungry to learn about this amazing letter, captured in bold text and colorful pictures. By Judy Freudberg Ernie and Bert identify certain vegetables for Cookie Monster and show him how to make vegetable soup. NOTE: This website is a private site and is in no way associated with Children's Television Workshop, PBS, Jim Henson Productions, or the Sesame Street Characters. All sales through this website are made through Amazon.com unless otherwise noted.